I feel like I just gave away the ending. What surprises can be left, now that you know there is a hint of maple syrup? (of course it could be that one ingredient that I forget and then it will be a surprise when one doesn't even taste a hint of it) Surprise! I forgot it! No, no, I'll remember it. There are very few ingredients in this recipe, so I better remember it!! I have a feeling some deep breathing exercises might be necessary today. 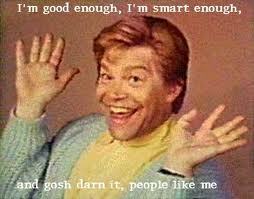 And perhaps some self affirmation from Stuart Smalley. Okay, I'm ready to get this dough into a state of pie. On paper, pie dough could not be easier. Yet it causes me much angst. Oh sure I can make pie dough, but it seems so moody. Some days it can be all light and flaky yet other days heavy and tough. Bi-polar pie dough? The Baked boys weren't kidding when they said the dough would be sticky. But I'm not going to fret. Just going to pop it in the fridge and forget about it. The dough was real easy to roll out. It didn't stick to the rolling pin, or the surface I rolled it on. In fact, the dough seems quite sturdy <<worry lines forming on forehead>>does that mean the crust is going to be tough? I'm just going to move onto the filling now and not fret about the pie dough. Very simple filling; eggs, butter, sugars, buttermilk, flour, maple syrup. Easy peasy just whisk it all together. And ignore the fact that the flour doesn't really whisk into the eggs very well. But that's okay, the addition of the sugars seems to have helped the flour dissolve. Moving onto a new worry..... it looks like the butter is curdling after being stirred in. Not going to worry about it. (can't afford the botox to fix all these worry lines) I'm just going to pour this filling into my unbaked pie crust. Ooooo, it fits in there perfectly. Okay, it is out of the oven now. And all puffed up. After 20 minutes cooling it has settled down and looks like a perfectly simple (grandma just baked) pie. And tasty. Liking the hint of maple syrup. Gorgeous! I love this pie crust because it is so easy to work with. I love your post. And your pie! Lovely. This is my go-to pie crust. It can do no wrong, in my book. Your pie did turn out pretty! The dough seemed almost too easy to me, so I was kind of worried and I thought mine turned out a little tough. LMAO @ "big girl pants", Stuart Smalley, and worry lines-- this was a very entertaining blog to read! I loved your title as well. :) I had some similar issues with the flour not whisking in well, and pie dough freaks me out too. Looks like we both did okay though! What a cute post and yes, your pie is pretty.